In the past I have talked about etiquette issues in church. However, a situation occurred yesterday morning during mass that I felt was too good not to write about. As I addressed in my Sunday blog post, our area has experienced severe flooding. Because of this state of emergency that South Carolina has found itself in, we have received a few alerts on our smart phones. By alerts, I mean emergency alerts. With iPhones, there is a whole different setting you need to activate to silence them. Just because you have no tone for your texts, social media notifications, and phone calls does not mean your emergency alerts will be silenced as well. 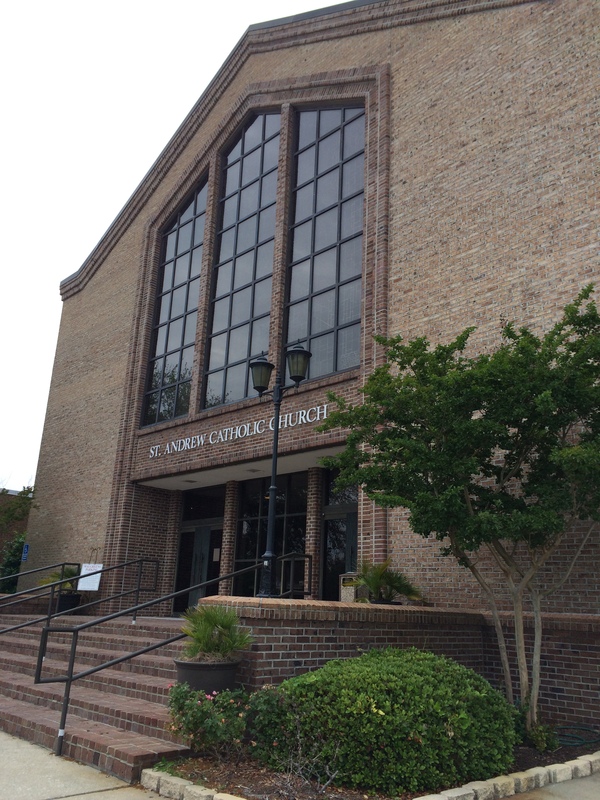 Sidney and I attended the 9:15 a.m. mass at St. Andrew Parish yesterday. The service started off just fine and after the gospel was read, Father James LeBlanc started to deliver his sermon. A little ways in, a tone filled the church. At first I thought it was a type of emergency alarm activated inside St. Andrew. However, as Fr. LeBlanc stopped to let the cacophony play out, I realized it wasn’t something that the church had installed. Rather, it was a sound I had heard before. I am a parishioner of St. Andrew and come June I will be getting married inside these walls. It suddenly made sense to me that the tone was created by the simultaneous iPhone emergency alerts going off. As I could hear the rain fall on the roof of the building, I knew what it was about. After the disturbance, Fr. LeBlanc went back to his sermon. About five minutes later, the phones started going off again as yet another emergency alert had been delivered. This time it was even more annoying as phones seemed to receive the alerts at different times, creating quite the nuisance. The first time it happened, Fr. LeBlanc responded with humor. He said the noise ushered in a good spot for him to stop talking and let a point settle. However, he wasn’t joking the second time the noise started. Fr. LeBlanc doesn’t get angry but you could tell he was a tad bit annoyed by the additional disturbance. “What is that?” he questioned. A woman in the front, who was an iPhone-in-church violator, spoke up. It was tough to hear exactly what she said word-for-word but she did get the point across that it was the emergency alerts going off. Without missing a beat, Fr. LeBlanc responded. And he was right on. There is absolutely no need for a person to have a phone on them in church. Emergency alerts are important but if you are attending a service you don’t need them. This is especially true at St. Andrew where there is a whole staff of people out in the vestibule and other non-worship space locations that would immediately notify all if a dangerous situation was near. After his stern reasoning on the pointlessness of having a phone in church to receive emergency alerts, he complimented it with some of his trademark humor. He then ended his second detour from his homily by asking everyone to please completely turn off their phones. Turning off your phones when entering a church is a good start but I recommend doing what Sidney and I do; just leave your electronic devices in the car. Open your glove compartment and throw them in there. I hope Fr. LeBlanc knows that he won’t have to worry about any phones going off when he marries Sidney and I on June 11. Don’t Blink.